We will have Bollywood dance. Don’t miss the fun!!! 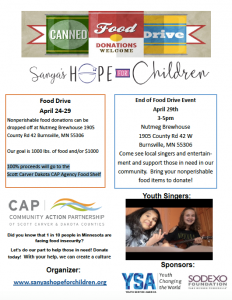 Come see local singers and entertainment and support those in need in our community. Bring your nonperishable food items to donate! Did you know that 1 in 10 people in Minnesota are facing food insecurity? Let’s do our part to help those in need! Donate today! With your help, we can create a culture of service.